We huddled on a rainy Sunday morning, May 4, 2014, at Pearson College docks nestled in verdant and vibrant Metchosin, British Columbia. We donned personal flotation devices or floater coats and hopped aboard the motor vessel “Second Nature” skippered by Director of Operations for Race Rocks, Chris Blondeau for a short but choppy ride to Race Rocks Ecological Reserve in the Strait of Juan de Fuca. Damp, but enthusiastic members of the 2014 Race Rocks field trip listening to Eco-guardian Courtney Edwards. Courtney Edwards(Race Rock’s eco-guardian) prepared a summary of the sundry critters awaiting our visit, which was read to us by Garry Fletcher, our trip leader and Race Rocks ER warden, while our boat stopped, for the purpose of pointing out a few history bytes of Pearson College (United World College), a bit about the region, William Head prison and the efforts to continue to support the preservation and natural environment of the area. Our skipper Chris encouraged us to support local businesses that contribute one percent of their profits to the critical protection of the eco reserve. We continued on and were greeted by Courtney and scrutinized by curious elephant seals as we clambered off the good ship and up the ramp to our destination, the Great Rock, one of nine in the Race Rocks archipelago. 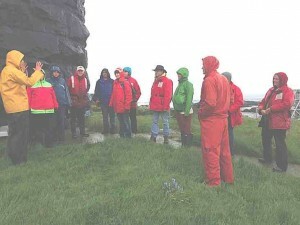 Garry, a modest and highly educated and experienced scientist, held our attention throughout the visit with details about Race Rocks, its critters, birds and mammals, crustaceans, even tiny fish, and their unique habits. He also gave a brief but concise history of the geology of the island, its early inhabitants who were builders of burial cairns that have been preserved. Garry explained some of the machinery on the island, both old and new including the old fog horns and the newer solar panels, that keep the Rock alive, all while navigating our way past elephant seals who found us as interesting as we found them. Garry advised “don’t get too close if you want to keep your leg”. Perhaps it was meant as a small jest but we took this most seriously and did not seek to make friends with these large marine mammals. We gave them a wide berth on the cement walkways. Our gracious eco-guardian and hostess, Courtney, introduced us to the joys of living on the Rock, of dealing with wildly changing weather, finikity machinery and equipment maintenance and breakdown, of working around wild life on the wild life’s terms and related quite a few comical anecdotes she has witnessed on a day-to-day basis. She not only battles the weather, she has to work with the fickle and unpredictable behaviour of the marine creatures both bird and mammal. She goes to work some days with a shield in one hand and a shovel in the other. She monitors the collection of fresh water and works within the parameters of a sustainable and eco-friendly environment. She collects valuable data and is an asset to the work and life on the Rock. Lester Pearson College (UWC) hires and funds the support of an eco-guardian for Race Rocks as part of its commitment to managing the facilities and the reserve at Race Rocks. Courtney adapts to her rugged but very interesting environment on a rock in the middle of the racing and raging torrents of the Strait of Juan de Fuca. A young eagle provided interesting and comic relief by chasing and being chased by the gulls and vying for the best lookouts on the Rock. Naturally, the eagle prevailed. In small groups we climbed to the top of the lighthouse where Courtney answered questions and told us more stories about the now automated lighthouse. On the ground Garry gave mini-talks about various aspects of the Rock. He showed us an old decommissioned cannon that had been salvaged from a dive and once thought to have been used as ballast for a ship. For such a small rock there are many stories and simply not enough time. We were only on the Rock for about 90 minutes but it was a thoroughly enjoyable and interesting trip. Thanks to FER and Pearson College for making this type of experience possible. Thanks also to FER Board members for their important contribution to the care and maintenance of our Wet Coast ecology and heritage.